Meeting place for the world's route development industry. A place where every type of airline, airport or tourism authority from every continent can meet face-to-face in a single location, whether they are a flag or a low cost carrier, hub or regional airport. All at a fraction of the time and cost of the airports visiting carriers individually. Routes Africa brings together top-level speakers from across the sphere of aviation to discuss the most pressing issues facing the industry. during the Routes Africa conference programme. Next year will see the 21st World Route Development Forum head to Africa for the first time when the event comes to the coastal city of Durban. As World Routes 2014 drew to a close, this year’s hosts Chicago Department of Aviation and Choose Chicago officially handed the baton over to the Province of KwaZulu-Natal, South Africa. Michael Mabuyakhulu, Provincial Minister of Economic Development, Tourism & Environmental Affairs, told Routes News that hosting World Routes in Durban would be an incredible opportunity and experience for KwaZulu-Natal. Many of the region’s key stakeholders have joined forces in support of World Routes 2015, including the KwaZulu-Natal Department of Economic Development, Tourism & Environmental Affairs; Tourism KwaZulu-Natal; Trade & Investment KwaZulu-Natal; Airports Company of South Africa; King Shaka International Airport; Dube TradePort; Durban & KZN Convention Bureau and eThekwini Municipality. Mabuyakhulu believes that hosting the event will further assist the province in securing more direct air linkages with the rest of the world, which he sees as “essential for accelerating the region’s radical economic growth”, especially in the tourism sector. “We are very fortunate to have leaders who understand that when you pull together, you have a far greater chance at success; that has been the driving force behind our achievements,” he added. King Shaka International Airport is a brand new multi-billion rand investment that opened in May 2010, just ahead of the FIFA World Cup football tournament. The airport, along with its adjacent industrial development zone, the Dube TradePort, provides world-class multimodal transport and trade logistics that is enhancing the country’s intercontinental passenger travel and freight transfer. 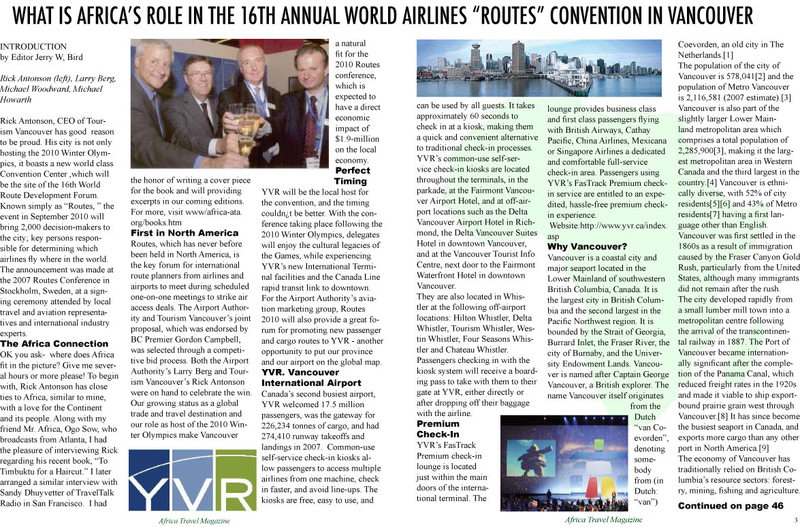 “World Routes is the equivalent of the World Cup of Aviation, so our hosting of the event definitely adds a new dimension to our efforts in developing routes. “We want delegates to know that we are ready to welcome them: Durban is ready, KwaZulu-Natal is ready and Africa is ready; we look forward to welcoming you next September,” Mabuyakhulu added. The 8th Routes Africa will take place on 7-9 July 2013, Kampala, Uganda and is hosted by Civil Aviation Authority of Uganda and Entebbe International Airport. Routes Africa is the key event for Airports, Airlines, Tourism Authorities, Policy Leaders, Keynote speakers and exhibitors to meet, do business and plan for the future. The annual networking gathering brings together more than 250 key players in the airline and airport industry from across the African region and beyond for strategic networking on air service development. Uganda, which is widely known as the Pearl of Africa, has a fast growing tourism sector with an annual growth rate of 21% on average, contributing 24% of the total foreign exchange earnings. Domestic tourism has grown by 50% over the past 10 years. Uganda is an investment destination especially after the discovery of oil in Uganda. This has greatly boosted passenger volumes through Entebbe International Airport. We look forward to seeing at Routes Africa, Kampala, Uganda. Routes Africa will bring together route development professionals from across Africa, the Middle East and beyond to discuss the latest developments within the region and establish potential for new air traffic routes to, from and within Africa. This annual event is the only network development forum for the entire African region and, this year, will build on the successes of previous events.This year's event, which is hosted by the Seychelles Tourism Board in partnership with the Seychelles Civil Aviation Authority is expected to attract up to 150 delegates including around 30 airline network planners. Welcome to World Routes 2012 in Abu Dhabi. The future is here. And in more ways than one – the 18th World Route Development Forum is the largest global event of its kind, determining the future of air services; while Abu Dhabi, capital of the United Arab Emirates, is one of the most forward-looking, centrally located and easily accessible cities on Earth. Hosted by Abu Dhabi Airports Company and supported by official carrier Etihad Airways and Abu Dhabi Tourism Authority, the 2012 event is targeted to attract over 2,750 delegates from more than 80 countries. It also marks the first time the event has returned to a previous host city. Back in 1996, Abu Dhabi’s downtown Hilton Hotel was the setting for one of our first World Routes events. 16 years later, delegates will be able to witness for themselves the immense changes that demonstrate how the city’s future as a world class destination is taking shape, and experience firsthand the wonderful Arabian hospitality of Abu Dhabi.